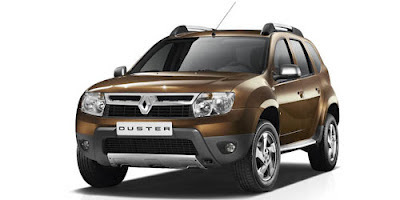 Carnation Auto Blog: Renault Duster Price Shock Ready To Shatter the SUV Price Glass Ceiling!! Renault Duster Price Shock Ready To Shatter the SUV Price Glass Ceiling!! What’s the biggest buzz going around in the world of Indian automobile industry? Just two words: Renault Duster. So what if Renault Fluence, Renault Koleos and Renault Pulse aren’t doing much to propel the company into the big league, the company has a couple of aces up its sleeve. And these include the ‘Mini’ SUV, the Duster. And in order to leave no stone unturned to achieve success with its launch, Renault, the French car maker, is planning a strategy to shock the car buyers and the industry. This is similar to what Nissan did when it launched the Sunny, or when Ertiga was launched by Maruti. The strategy paid for Nissan and Maruti as several pages of their order book got used really quickly. If sources are to be believed, the Renault Duster petrol variant may be priced just below 6 lakh, while the diesel variant of the Duster may be just over 7 lakh. If I were a Hyundai or a Ford, I would surely be running back to the boardroom with my marketing team in an attempt to make sure my next launches…the Ford EcoSport or the Hyundai MPV are ready to face the ripple effects of this shocking play by Renault! So when does the Renault Duster actually hit the Indian roads? While production will begin in July, the cross-over will be ready for sale in August 2012. The Indian version of the Renault Duster is likely to be powered by Nissan’s 1.5-liter petrol engine, the same that’s powering the Sunny. Duster diesel will get the successful 1.5-liter DCI engine. The fully loaded variant of the Renault Duster will be fitted with ABS, EBD, Dual front airbags, leather upholstery, and keyless ignition among other features. Get a grab of Renault Duster’s specs and pictures here. You can be one of the first to test drive the Duster. So go ahead a book a test drive now! would like to see this car whenever I have time! wow! Indeed a very nice review. I really love it's features. The French auto major officially proclaimed that it is going to roll out five passenger vehicles by the end of this year; out of these five Renault has already rolled out Fluence, Koleos and Pulse (petrol) and now it’s time for Renault Duster to break covers. Renault Duster is sold in the global market under Dacia badging. Duster is spawned on B0 platform and comes with an overall length of only 4.3 metres.